Sometimes I wake up in the night and I feel afraid. It has been like this since my childhood. His name is Jesus, Jesus, Jesus, Jesus. Oh! He is the king. The more times a song contained the name of Jesus the more I loved it. I would whisper these songs into the dark of the night and the fear, which filled my heart, would slink away. In the last few years, there were times when Xylon had a fever while having chemo where I would lie still next to him stilling myself so I could hear his breathing, so I could assure myself he was okay. And then I would find myself singing. Worshipping God. I love that it moves worship from just being nice sounding songs to being a weapon. There is a story in the bible about the time that Jehoshaphat went to war using worship as his weapon. He was leading a group of people who were very afraid about the army they were about to go up against. Give thanks to God, His love never quits. 2 Chronicles 20 says, that as they began to sing and praise, the Lord sent ambushes and the armies that were against Jehoshaphat turned on each other and killed each other. By the time they came to the place that overlooks the desert and looked toward the vast army, they saw only dead bodies lying on the ground; no one had escaped. What a picture of worship as war. Singing seems such a silly thing to do when you’re fighting a battle. But worship is more singing. 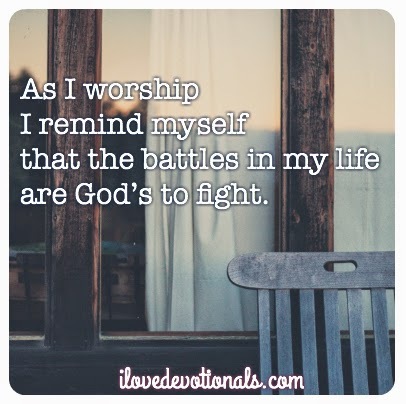 Worship is inviting the God-of-the-Angel-armies to fight for us. As I sing I am fighting the enemy of my heart, and inviting God to fill me with love, power and a sound mind. 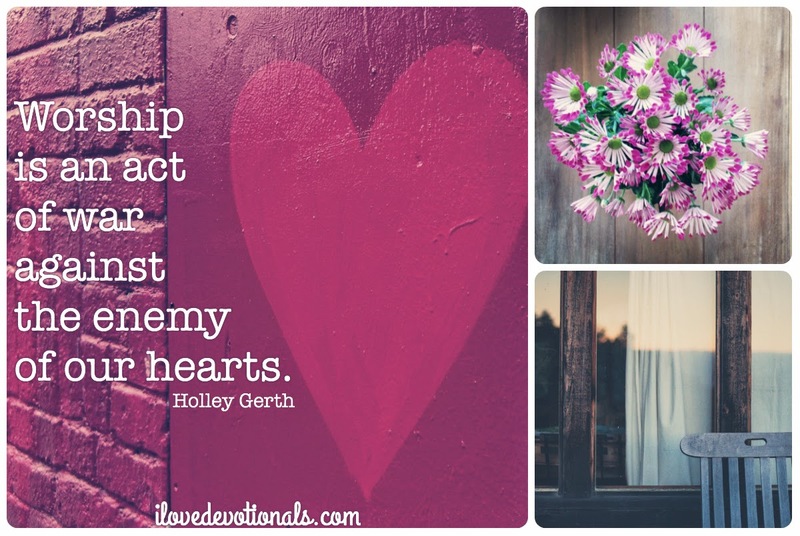 Ponder: Have you ever thought of using worship to fight fear? Prayer: Lord, teach me how to use worship to fight fear.